There is nothing that fills one with as much anticipation as planning the next break away. Holidays are the best time of the year, allowing one to slow down from the city pace, stay in relaxing accommodation, and just get in touch with one’s inner self. For those who want to rest and reconnect, the small town of Graaff-Reinet in the Eastern Cape will be an excellent option for your next holiday. Graaff-Reinet is well known for its beautiful wildlife, historical and cultural museums and monuments, and superb restaurants and coffee shops. For those who relax by being physically active, there are adventures to be had in the area. Graaff-Reinet nestles in a horseshoe bend of the Sundays River and surrounded by the Camdeboo National Park. Day game drives, 4×4 routes, and walking trails are popular ways to experience the wildlife Camdeboo has to offer. The magnificent Valley of Desolation is a must-see on your Graaff-Reinet holiday’s to-do list. For those interested in water activities like rowing, fishing, water skiing, and open water swimming, the Nqweba dam will cater to your every whim. In town, there are many activities to keep you busy for days on end, like the Reinet House, the Hester Rupert Art Museum, the Graaff-Reinet Museum, and many monuments throughout the streets of this beautiful town. One of the town’s most prized jewels is the grand “Groot Kerk” Dutch Reformed Church, which is sight that greets guests when entering the town. Less than an hour’s drive away, close to Cradock, the more adventurous can enjoy a fun-filled day on the river partaking in white-water rafting. Also near Cradock, the Mountain Zebra National Park is bound to be a highlight of your holiday. Graaff-Reinet’s other neighbouring town is the very small and arty Nieu Bethesda. Those who enjoy art and photography will find that Nieu Bethesda is a must-do activity for them. During the holiday season, Graaff-Reinet’s restaurants, coffee shops, and breweries, like Polka Café, Pioneers, The Muller House, and Coldstream Restaurant, to name but a few, will impress even the most demanding foodie. With all the things Graaff-Reinet has to offer, one simply has to stay a bit longer, and the accommodation on offer is of the highest quality. There are many different types of accommodation to choose from for your next holiday. KarooRus self-catering guest house is, according to guests, amongst the best accommodation in Graaff-Reinet. Our accommodation has seven self-catering units have everything to make your stay as comfortable as possible. Each unit has a fully equipped kitchenette, an en-suite bathroom and shower, braai facilities (with wood included), and a private entrance for each unit. We offer safe, off-street parking to which only paying guests has access, and will accommodate trailers, boats, and caravans. KarooRus is near the centre of town and within walking distance of most amenities. We are pet-friendly, and we have accommodation for those with disabilities. Every unit also has DStv, air-conditioning, Wi-Fi, extra blankets, and even electric blankets for cold winter nights. Our accommodation is child-friendly too. To book your accommodation, contact us for more information about what we offer. Why Choose Self-Catering Accommodation in Graaff-Reinet, The Jewel of The Karoo? Graaff-Reinet, often called the Jewel of the Karoo, is renowned for the beautiful nature that surrounds this small town. Graaff-Reinet is also rich in Afrikaans culture and history which dates back to 1786. 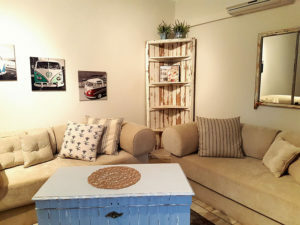 This quaint town offers a variety of accommodation options, from bed and breakfasts, self-catering guest houses, and backpackers hostels, to the local hotel. Accommodation will never be a problem for tourists either passing through or staying a bit longer in Graaff-Reinet. What do you expect to be included? Some people want a breakfast included, whereas others prefer to make their own breakfast plans. What makes self-catering a good option is that you are in charge of your own meals. This means you can decide what you want to eat and when you want to eat it. Graaff-Reinet has an excellent variety of restaurants to choose from. Self-catering accommodation also provides a kitchenette where you can prepare your own meals. How eager are you to get to your location? Being in a rush and just passing through Graaff-Reinet, or you wanting to stay a bit longer will have an influence on what type of accommodation you select. Self-catering is the better choice when you want to hit the road early and you cannot wait around for breakfast. You can leave any time you want and have a meal wherever you want. What are you willing to pay? Accommodation costs also have a major influence on where you stay. Bed and breakfast guest houses will be the more expensive option, because of the meals included. Self-catering, even though you pay for your meals somewhere else, will generally be more affordable. Do you have any pets? Not all accommodation types are pet-friendly. In Graaff-Reinet we have a list of pet-friendly accommodation options for you to choose from. Bedroom space? The living areas and bedrooms of self-catering accommodation are often more spacious than that of bed-and-breakfast establishments. This is primarily because, with self-catering units, more things are included, like a kitchenette with kitchenware and dining room tables. In Graaff-Reinet, the list of self-catering and bed-and-breakfast guest houses is long. However, according to many guests, KarooRus guesthouse is the best self-catering accommodation option in the entire Graaff-Reinet district. 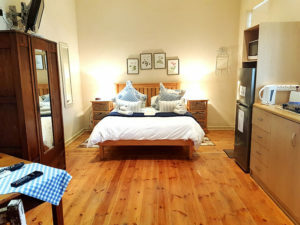 KarooRus has seven self-catering units, each with fully equipped kitchen, private en-suite bathroom, private and safe parking, and even braai areas with wood included. It is located in the heart of Graaff-Reinet and is walking distance from most shops and restaurants. We are pet- and child-friendly and there is a safe and private area where children and pets can play and be supervised from the comfort of your unit. Furthermore, our units are equipped with DStv, Wi-Fi, air-conditioning, a desk, and electric blankets. We provide baby camping cots and plastic baby baths with no extra costs upon request. For more information about our units, contact our team today.